September 3, 2010 -- Dr. Len Frey, dean of the College of Business at Arkansas State University, was recently reappointed to the Arkansas District Export Council. Dr. Frey was initially appointed in 2005, serving a four-year term, and has been reappointed for an additional four-year term. 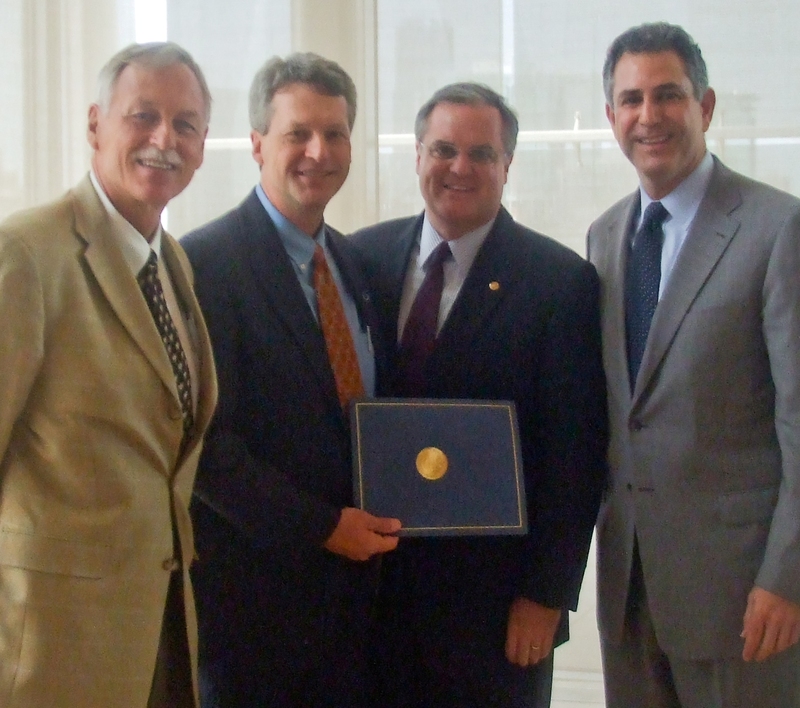 On August 17, Dr. Frey was presented with a certificate of reappointment by Francisco Sanchez, Under Secretary of Commerce for International Trade, Senator Mark Pryor, and Representative Vic Snyder. The presentation was made during the Arkansas Exporters Roundtable Luncheon at the Clinton Presidential Library. The nation’s 56 District Export Councils (DECs) are organizations composed of leaders in local business communities. The District Export Councils are closely affiliated with the U.S. Commercial Service's U.S. Export Assistance Centers. District Export Council members are appointed by the U.S. Secretary of Commerce. These international trade professionals use their knowledge and international business experience to act as consultants to small and medium-sized businesses wishing to export their products into markets outside the United States. This year, the Arkansas District Export Council sponsored the first-ever Governor’s Awards for Excellence in Global Trade on May 17. Four Arkansas companies were recognized for their successful exporting strategies. Governor Mike Beebe presented the Governor’s Award for Excellence in Global Trade to AmerCable Incorporated of El Dorado, winning in the large manufacturer exporter category; Weldon, Williams and Lick Incorporated of Fort Smith winning in the small/medium manufacturer category; Cobb-Vantress Incorporated of Siloam Springs, winning in the large agribusiness category; and Keith Smith Company Incorporated of Hot Springs, winning in the small/medium agribusiness exporter category. For more information on the Arkansas District Export Council, contact Patricia Gonzalez (Patricia.Gonzalez@trade.gov), executive secretary, Arkansas District Export Council and director, U.S. Export Assistance Center, Arkansas, at (501) 324-5794.